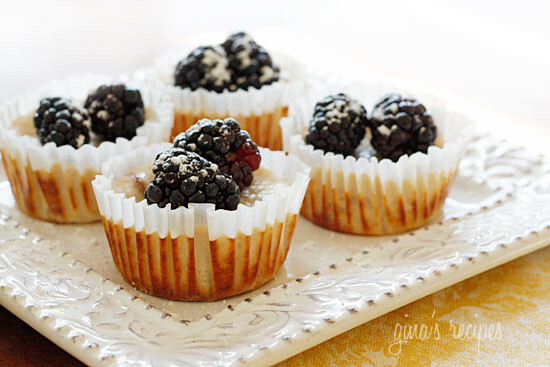 Lemony cheesecake cups made with Greek yogurt topped with fresh berries. Light, creamy and virtually guilt-free! Something about lemon says summer to me, perhaps it’s the color? I’m not quite sure but I do know the color yellow makes me happy and so do these little portion controlled cheesecake cups. Although these are meant to be eaten for dessert, I figured cream cheese, fruit and yogurt could easily be enjoyed for breakfast and that is exactly what I did this morning. Use whatever berries you want or a combo of mixed berries, you could even top it with pie filling. I actually made these two ways, one way as seen in the photo, the second way I added the berries to the cheesecake cups before I baked them so the berries baked in with the cheesecake. Both ways are equally good, but the berries on top made for a prettier photo. Mom always put vanilla wafers on the bottom of her cheesecake cups which is such a simple low-fat solution to create a crust. When the cheesecake cups bake, the cookies soften and all the flavors work together. Diabetics can use Splenda in place of sugar. Gradually beat in fat free yogurt, egg whites, lemon juice, lemon zest and flour. Do not over beat. Pour into cupcake liners filling half way. Bake 25 minutes or until center is almost set. Cool to room temperature. Chill a few hours in the refrigerator. Top with fresh berries and powdered sugar if desired. Hi, Gina. Will you double check the points for this recipe? I just put all the ingredients into the WW recipe builder and it gave me 5 FS points for each. But, even it’s 5 points, this is a great dessert. I’ve made it before and it was a HUGE hit. Below is what I had entered. the yogurt comes up 4 and the cream cheese 23, could be different brands vary slightly. I was wondering if Skyr (a type of Greek yogurt) could be used instead of the regular yogurt or would it be to thick? I haven’t tried, if you do let me know! I made these without the cookie bottom and they were awesome! 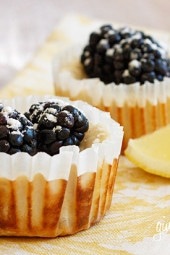 For more lemon flavor, add lemon extract in place of the vanilla extract. Have you tried this with pumpkin? I’m looking for a low carb/low sugar alternative to Pumpkin pie for Thanksgiving for diabetic family members. Do you think ginger snaps could also work as a crust? I just made these since I had a brick of cream cheese to spare. I broke up bits of graham crackers as the base and they turned out fabulous! Since February is "National Heart Month" and next week is V-Day, my company sponsored a healthy dessert contest today. I would like to let you know that these cheesecake cups won me first place in that contest! 🙂 I credited your website of course. Thank you for sharing such a wonderful, light dessert that everyone enjoyed! A great recipe! Thanks for mentioning that diabetics can use Splenda instead of sugar. But one other observation is that low fat and fat free has more sugar content. As a diabetic I just used the regular product if sugar free cannot be found. These were delicious! So perfect for a weeknight dessert. Easy to make, and easy to control on the portion. I made these just as directed, and they came out just perfect. Yum! Do you think it would be fine to use the green mountain farms greek cream cheese in this recipe? These are amazing. I'm not a lemon fan so I made them with strawberry greek yogurt, some jam and cut up strawberries instead of the lemony stuff.. still turned out fabulous. Would using plain greek yogurt make much of a difference than using vanilla greek yogurt? If it does, what should I add into the plain greek yogurt to make it taste like the vanilla one? Using 3 of your amazing recipes for dinner tonight and I think I'm looking forward to this one the most!! I made these, and the Nilla wafer on the bottom got soggy after putting them in the fridge. Any suggestions? thanks! Hi Gina! I live in the US, but my family is in Germany and my mom is on weight watchers but there are no vanilla waivers in Germany! Could.you also use other cookies as long s they fit into the cupcake pan?? I made a peppermint version of this by using Keebler Grasshopper cookies (aka Thin Mints) as the crust and using 1 teaspoon of vanilla and 1 teaspoon of peppermint extract. I finely chopped around 6 peppermint white chocolate Hershey's Kisses because I didn't have any candy canes or mints laying around and to give some red flecks. They turned out great! 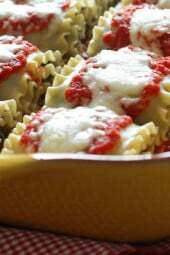 I love this recipe and changing up the flavors! These are great. I enjoy the lemon flavor. The berries and dusting make them rock! These are so good! I spaced out and forgot to buy the cookies (had planned on using gingersnaps), so I ended up making a graham cracker crust that I found on Weight Watcher's site. I'm a calorie counter, not actually a WW, so I don't know if that changed the points, but it made the calories go up to 130ish. I topped w/ a bit of raspberry jam since I don't like whole berries. Very good! Taking them tonight to my aunt who has been having some health problems, cheesecake is one of her favorite desserts so I'm sure she'll love these. To Anonymous, I don't think these would mail very well, it'd be hard to keep them cold, even with ice packets, plus they're a bit fragile. Hey Gina, I have friend that loves these and I would like to send them to her in the mail. Do you think these would stand up to being sent through the mail if done properly? Maybe with some ice packets or something? Thanks Gina! I've made these twice, and they were fabulous both times! I topped with strawberries and white chocolate chips, and the second time I used lemon cookies in the bottom. Yum! Are the points the same if you use splenda? Making them for my mom and I know nothing about weight watchers points. I made these last night to take to my family's picnic today. They were a huge hit! Thanks for a delicious and easy recipe! Holy mackerel! I just pulled these out of the oven 30 min ago. On the way to chill in the fridge, one mysteriously popped out into my hand and I decided to sacrifice it for a taste-test on my boyfriend — he loved it (and so did I, of the small nibble I got!). Very pleased, I took some of the suggestions above and baked blueberries right in. Going to make a double batch tomorrow morning and make the rounds to the neighbors! They turned out great! Thanks for another wonderful recipe. 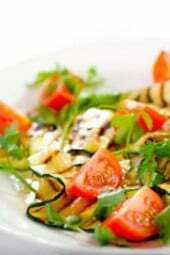 Another fabulous recipe from your site!!! I made these last night and they were a HUGE hit! I used the Chobani lemon yogurt as another poster recommended and it was delicious!!! I can't wait to try them again with different flavor combinations. Just made these on the weekend for a bachelorette party dinner I was hosting – they were a huge hit! I poured half the batter in each cup, put in a couple blueberries, then filled up with the rest of the batter. Having the fruit baked in, as well as topped with strawberries gave it a nice texture and taste profile. No one could believe they were so low-cal! I LOVE your site! Once again–Outstanding! I have to admit I did turn these little delights into a 4 point elegent dessert. I made a lemon curd which was enough for at least 15 so my calculations would be 1 extra points plus. I must have picked up this idea from another reviewer. They were certainly a hit and I had enough to send some home with our company so we were only tempted 2 more nights but my husband and I shared 1 so it was tasty but not bad on the points. Oh, I also added blueberries and a sprig of mint. Very pretty and sooooo good! P.S. I read all the reviews before checking out the recipes and find this most helpful. Thanks again Gina and all your followers. Hi! So excited to try this recipe and love your site! Do you know if this could be made in a 9×9 baking dish (perhaps doubled)? If you keep them refrigerated, how long will they last. I'm thinking of making some this weekend and I want to take some of them to my sister next Thursday for her graduation. These are so amazingly delicious! Mine didn't turn out super lemony like I expected. I love lemon – so I will probably add more lemon zest next time. Or maybe I'll use the lemon-flavored greek yogurt instead of vanilla. Just made these! Have a feeling most of them will be going back to college with the kiddos. They're very popular! I just popped these in the oven but used low fat strawberry cream cheese. Hoping they turn out good. So many possible variations on flavours and toppings. Amazing! These are exactly how you described – light, creamy and delicious. 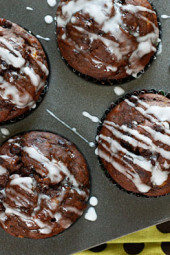 Gina, curious if you have ever made a version of these with chocolate instead of lemon, if so, how much cocoa did you use? My sister and I made these yesterday and they turned out great — so yummy and pretty! We made them in a mini cupcake tin and it made about 36 (maybe 1pt each?). 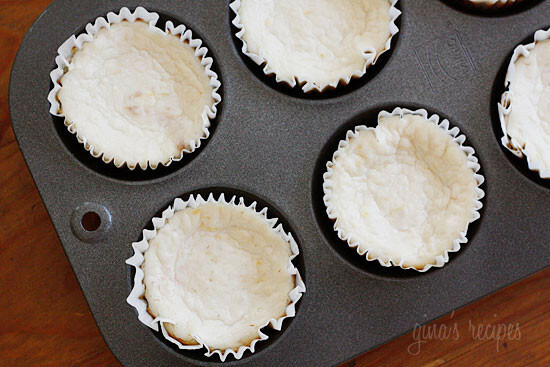 The nilla wafers wouldn't fit in the bottom, so we had to crush them, add a little melted butter (shh…), and press them into the bottom of our mini cupcake liners to make the crust. We cooked them for about 15 minutes, topped them with a stawberry slice, and then proceeded to eat about 6 of them. It's a good thing they are so low in points! I made these little cuties this weekend. I knew they would be great just from a taste of the batter. I was even able to find blackberries so I could match the recipe exactly. This was a perfect light dessert — just 4 or 5 bites of perfect lemony cheesecake. All this and only 3 points! Incredible. I love that it makes twelve. I sent some home with my guests and still still had enough for dessert again today. 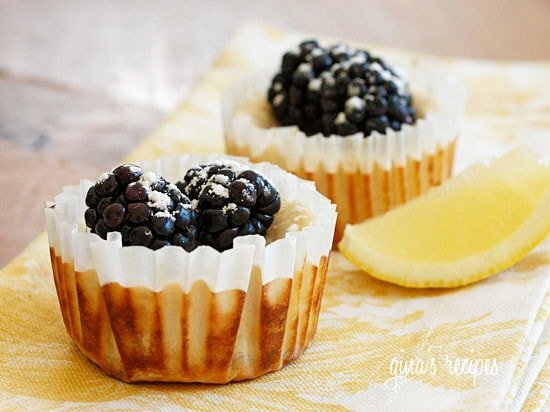 My hubby has to bring a healthy/low sugar dessert to a meeting next week so I'll make these again but use Splenda instead of sugar. This recipe is a keeper! Thank you. The taste was refereshing, but I made them the day before, and I found the vanilla wafer got soggy when left in the fridge. I think next time I would make with ghram cracker crust. HOLY COW!!! These are so amazing! I was so proud of them I had to bring them in to work and EVERYONE was impressed. Your blog has become my new favorite place to browse!! Ok, so we're going to a dinner party and I was told to bring a "healthy" dessert. I chose these. I just put them into the pan and I cannot stop licking the batter in the bowl. OMGoodness! I cannot wait to see what these come out like. Going to serve a blueberry reduction sauce over them. 🙂 Yum!!! Wow, another amazing recipe. These are delicious. Just made these tonight. They smell so good. Can't wait for them to cool off so we can try them! I love your recipes! Do you think I could omit the lemon all together and add pumpkin and pumpkin pie spice to make them holiday friendly?